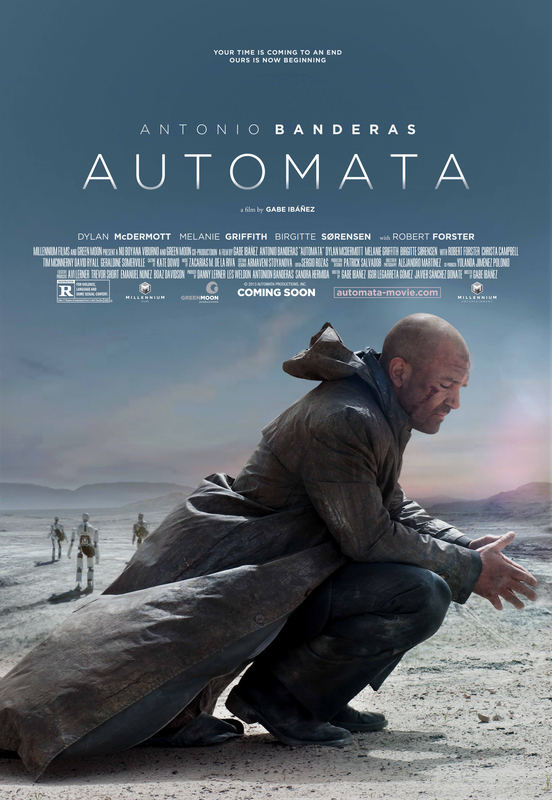 I had the chance to sit down with Automata and to put it bluntly, in writing this I believe I’ve saved you from a sluggish hour and fifty minutes. Banderas plays Jacq Vaucan an insurance agent working for ROC, a corporation who build, maintain, and insure robots called Pilgrims (I bet you already see where this is going). Real quick, that name? In doing the absolute briefest amount of additional research I discovered an interesting tidbit. He’s named for Jacques de Vaucanson, the creator of many early automata…yeeesh. Could you imagine any other movie with this overt of a name game? “This is the film Her, about a hyper intelligent OS, like Siri on steroids, the main character is named Steven Jobs.” Or Deckard being named Al Turing in Blade Runner. Maybe I’m over-reacting. You would just think that with something like this, the audience who is jonesin’ for a new robot movie might know a thing or two about the history of robots. Onward! So, Vaucan is an insurance guy in this dystopian future. The sun has flared up, scrambled communications and most technologies leaving the planet whittled down to 21 million humans living in cities walled off from the vast desert of the Earth. To keep these cities running, the folks at ROC have made robots that adhere to the Two Laws of Robo- I mean, two protocols. One, an automaton cannot harm anything living. Two, an automaton cannot alter itself or other robots. Makes sense right? Well, Vaucan spends his time disputing insurance claims when folks believe their automaton has led to harm by breaking either of these two protocols, ROC certainly doesn’t want to pay any of these bills! When the cops discover a robot that appears to have been self-repairing the hunt is on to discover just who broke the second protocol. All things considered this movie had a few really interesting pieces at work. The world building is rad, feeling very much like a Blade Runner (which I’m sure this movie will see far too many comparisons to but hey, if the android fits…) and Banderas playing a regular old pencil pusher who gets caught up in this mystery makes for a nice twist of a character to follow. The robots look great and are shown in a variety that works. Eventually the robots, with Vaucan in tow, complete their pilgrimage across the desert and take on a new look and separate themselves from humanity, again it works. At the heart of the movie there is this creation and intelligence argument and where humans and robots stand on either side of this equation. The tagline is “Your time is coming to an end. Ours is now beginning.” after all. The rest of the movie moves on with this low-key mystery until it ultimately gets bogged down by two dimensional villainy, requisite gunshots, and less than stellar acting from most involved. Which is a bummer. At about the halfway point the hunt for the protocol breaking mystery man is complicated by Bad Company Guys 1, 2, and 3 hunting down Banderas. These couldn’t be any more nondescript and un-intimidating. I guess the folks at ROC assume he has gone native with the robots and mean to stomp it out. Inside these scenes there is another great piece of world-building tucked away making them not entirely a drag. Those original protocols? They were developed by the very first robot’s artificial intelligence that advanced far faster than its human creators prepared for and they had to rely on it to create its own barriers. That’s an interesting nugget! I’ve an entirely skipped over a side plot involving Vaucan’s wife and unborn daughter, his desire to move out to the coast as he’s sick of the city. These are usually accompanied by some sort of dream/memory sequence of Vaucan on the beach as a young boy, playing with a turtle and flipping it on its back to rub its stomach. I don’t even need to say it right? What this movie has going for it, it squanders in lackluster execution and it really bums me out. It is by no means the worst film featuring robot awareness mysteries but it doesn’t do anything special with it. Wait for it to come to DVD/BluRay if you really want to check it out. ← Batgirl #35: Welcome to Burnside! I would far rather they make an Almost Human movie (or series of movies) from the 2013/14 tv series. The show was a big hit (4th scripted show and 7th overall on the FOX network), was ranked 30 out of the top 50 shows of the year, and top 2 of the critics choice of best new shows, and is gaining even more popularity worldwide. Despite it’s popularity (even against impossible competition like The Voice, The Olympics and How I Met Your Mother’s final season) Peter Rice, CEO FOXTV, over ruled the recommendation to renew the show for another season. His incomprehensible decision is reminiscent of FOXTV choosing not to renew Firefly, also after a paltry 13 eps. Almost Human has an amazing android who is able to feel emotions, like a human: Dorian, played by Michael Ealy; and very militaristic MX androids which are logic based. The rest of the solid cast is led by Karl Urban and including Lili Taylor, Michael Irby, Minka Kelly and McKenzie Crook. Set 2048, this is a complex world with great special effects, also reminiscent of Blade Runner, but better, more hopeful and there is still a LOT of story to tell. JH Wyman (Fringe) has a five year story plan. Fans have a campaign to get this show back, perhaps as a series of movies if not as a tv series. For more info, sign the petition at http://www.change.org/p/save-almost-human ; join the tweetouts on Mondays 8-9 PM to #SaveAlmostHuman and join the mail out to send noodles and toy legs on 17 November to Warner Brothers (who own the show). If you’ve not seen this show, do yourself a favour and order it on itunes (about the only place you can get it since it’s only available in the US through Warner Archive and Amazon.com).